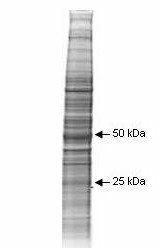 ready-to-use A431 Whole Cell Lysate are especially prepared as positive controls for separation by SDS-PAGE and subsequent western blot analysis. Lysates are prepared in denaturing buffer WITHOUT dissociating agents (i.e. no 2-mercaptoethanol or dithiothreitol has been added). Heat lysate to 95°C for 5 minutes and rapidly cool. If dissociating conditions are desired, add reducing agent prior to heating. The recommended loading volume per lane is 10-20 μl depending on the size format of your gel.